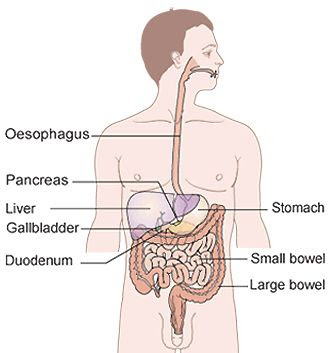 The pancreas is a gland about six inches long in the upper abdomen (behind your stomach and in front of your spine) located beneath the stomach and adjacent to the first portion of the small intestine, called the duodenum. The pancreas has two main functions, exocrine function (make production of enzymes that help in digestion) and endocrine function (make production of the two hormones, insulin and glucagon). Pancreatic cancer (cancer of the pancreas) is group of cells display uncontrolled growth (malignant neoplasm) found in the tissues of the pancreas, Also called exocrine cancer. Pancreatic cancer often has a poor prognosis even when diagnosed early. Pancreatic cancer typically spreads rapidly and is seldom detected in its early stages, which is a major reason why it's a leading cause of cancer death. Pancreatic cancer in the United States, about 42,470 individuals are diagnosed with this condition and 35,240 die from the disease. In Europe more than 60,000 are diagnosed each year. From total of patient who diagnosed as Pancreatic cancer, Only less than 5 percent are still alive five years after diagnosis. Pancreatic cancer occurs when cells in your pancreas develop genetic mutations and cause of cells to grow uncontrollably and to continue living after normal cells would die. Diet. Diets low in vegetables and fruits, Diets high in red meat. There is occasionally talk about coffee drinking being linked to pancreatic cancer, but this has not been confirmed in research studies. Alcohol. It is controversial whether alcohol consumption is a risk factor for pancreatic cancer. Patients with chronic pancreatitis in people who drink a lot of alcohol doesn't increase their risk as much as other types of chronic. If there is a link with alcohol and pancreatic cancer risk, it is only very slight. Other medical conditions. Such as; Long-term diabetes, Chronic pancreatitis, Helicobacter pylori infection (Stomach ulcer), Gingivitis or periodontal disease, and Certain hereditary disorders. Cancers running in the family and genes. This is a rare condition, In 5-10% of pancreatic cancer patients have a family history of pancreatic cancer. The genes responsible for most of this clustering in families have yet to be identified. Statins. One study has shown a reduced risk of pancreatic cancer in men taking the anticholesterol drugs, statins. Pancreatic cancer that forms in the pancreas ducts (adenocarcinoma). Cells that line the ducts of the pancreas help produce digestive juices. The majority of pancreatic cancers are adenocarcinomas. Sometimes these cancers are called exocrine tumors. Pancreatic cancer that forms in the hormone-producing cells, it's called endocrine cancer. Endocrine cancers of the pancreas are very rare. Signs and symptoms of pancreatic cancer often don't occur until the disease is advanced. On the early stage it will not present the symptoms, That is the reason why the Pancreatic cancer also called a "silent killer". The medical team will see the condition of patient when they decide to give treatment for pancreatic cancer. There are many factors to treat of pancreatic cancer; How the cancer's type, size, and extent of the tumor as well as the patient's age and general health. The most action to treat of pancreatic cancer are Surgery, Radiation therapy, Chemotherapy, Targeted drug therapy, and Nutritional supplements.